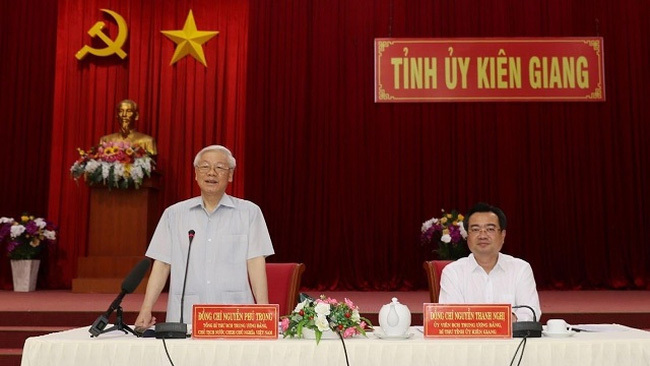 VTV.vn - Party General Secretary and President Nguyen Phu Trong has asked authorities of the Mekong Delta province of Kien Giang to fully tap its potential and strengths, especially in agriculture and tourism, in order to well perform tasks and orientations set for the locality in 2019. The top leader asked for strategic orientations, master plans and specific plans for each field, saying that these are necessary to devise polices on investment attraction, goods consumption, infrastructure development, and human resources training. Reports at the meeting showed that the province’s economy has recorded stable growth with its GDP hitting over VND62.3 trillion (US$2.68 billion) in 2018, 1.23 times higher than that of 2015. The average GDP growth in 2016-2018 stood at 7.13%, while per capita income increased from US$1,664 in 2015 to US$2,094 in 2018. Attention was also paid to the new-style rural areas development movement, helping bring better living conditions of local people. The sea-based economy accounts for 73.82% of the province's GDP. The service sector grows at an average rate of 11% per annum; and its export turnover surges 17.61% per year. Tourism has become a spearhead economic sector of the province, with its revenue reaching over VND11 trillion (US$474.5 million) a year, yearly average increase of 23.9%.